Fanglan Mansion was the first domicile of the Chen family when they immigrated to Taiwan from Anxi in Quanzhou County, Fujian Province. They later constructed two other estates, New Fanglan Mansion (no longer extant) and Yifang Mansion. All these structures lay with their backs to Chanchu Mountain, at high, easily defensible elevations, reflecting the perils of early pioneer life. The original layout of the Fanglan Mansion was a traditional three-sectioned structure with central building and left and right wings. Construction materials included local Taiwanese stones, and bricks and fir wood shipped from mainland China. A waterwheel attached to one of the exterior walls was decorated with clay moldings. 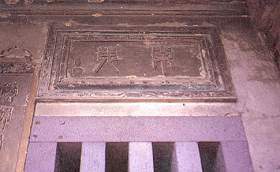 Earthen Chinese characters were placed across the tops of doors and windows; the intricacy of their workmanship is still evident. The building’s wings collapsed and are no longer extant.